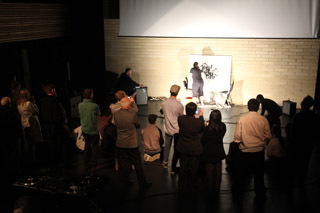 Seeing Sound 2 took place at Bath Spa University on the 29th and 30th October 2011. The event was bigger and (hopefully) better than the first. There were considerably more papers, including three fantasic keynotes. Two evening performances, a plethora of screenings, and for the first time this year, several installation works completed a rather packed weekend! Many of the films, videos, performances and installations are viewable online. They’re gathered in a page here.